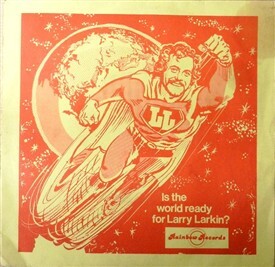 Is the World Ready for Larry Larkin? 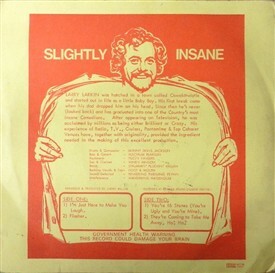 "Government Health warning: This record Could Damage Your Brain"
4. They're Coming to Take me away Ha! Ha! 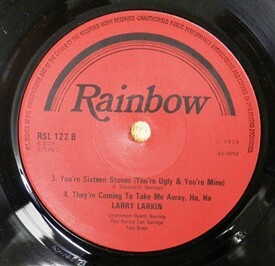 Text on the back cover reads: "Larry Larkin was hatched in a town called Oswaldwistle and started out in life as a little Baby Boy. His first break came when his dad dropped him on his head. Since then he's never (looked back) and has graduated into one of the Country's most insane Comedians. After appearing on Television, he was acclaimed by millions as being either Brilliant or Crazy. His experience of Radio, T.V., Cruises, Pantomime & Top Cabaret Venues have, together with originality, provided the ingredient needed in the making of this excellent production". Larry’s comic genius has been seen and enjoyed on countless cruise ships over the years. He is a seasoned cruise ship performer who will have any audience rolling in the aisles. 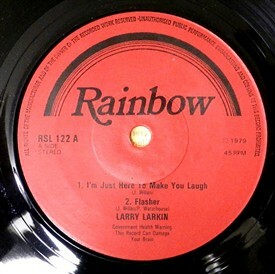 Always tasteful and always hilarious, Larry Larkin is a one-of-a-kind comedian who knows exactly how to tickle everyone’s funny-bone. No-one is immune from the effects of this man’s zany infectious brand of humour and he is guaranteed to send his audience out with aching sides and tears rolling down their faces. This page was added by Website Administrator on 20/02/2017. The Road Band - "High Mileage"